Beading Arts: Just for fun! Mike and I went to our favorite date spot on Saturday...Home Depot! I know, I know. We're pathetic, aren't we? 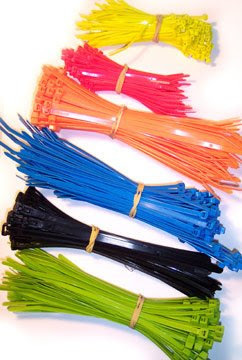 Anyway, I found a big jar full of 500 zip ties in lots of different colors. They were cheap cheap cheap, which is my favorite quality when it comes to making jewelry for purely costume purposes. Now I'm not talking about "costume jewelry", I'm talking about jewelry used for a costume! 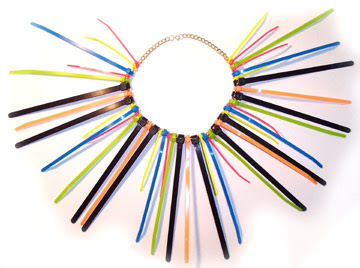 I got the idea for this very quick and easy necklace that anyone could make for Halloween or other dress-up occasions. I've got a great wig for Halloween this year (when don't I? ), and I wanted a special necklace to go with it. Then, just add outrageous makeup, and I've got instant costume. 1. 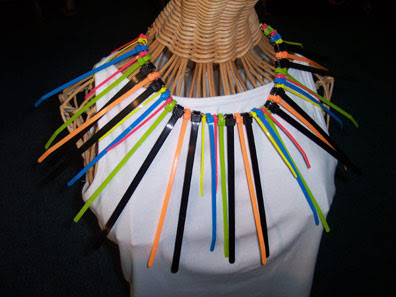 Lay out your zip ties in any pattern that pleases you. I wanted them to extend all the way over my shoulders, but not stick out the back of my neck, so I left a few inches of chain bare in the back. 2. I used an 18 inch curb chain with fairly large links. Even so, they weren't big enough for most of the zip ties to go through them. Starting from the center, I wrapped the zip ties around the chain and snugged them up. The shorter thinner ties fit right through the links, which I did in order to keep the rest of the ties from sliding around. They provided an anchor every couple of inches. 3. That's it! Put it on and smile when people stare at you. Best part, there were still hundreds of ties left over for my husband to use in his projects! That's so great looking! I can't wait to make one myself. It's such a no-brainer project too, Lisa! Just use any old chain that you happen to have sitting around ~ no need to polish it up either LOL!! That is so cool! What great costume possibilities! I love that kind of creativity!